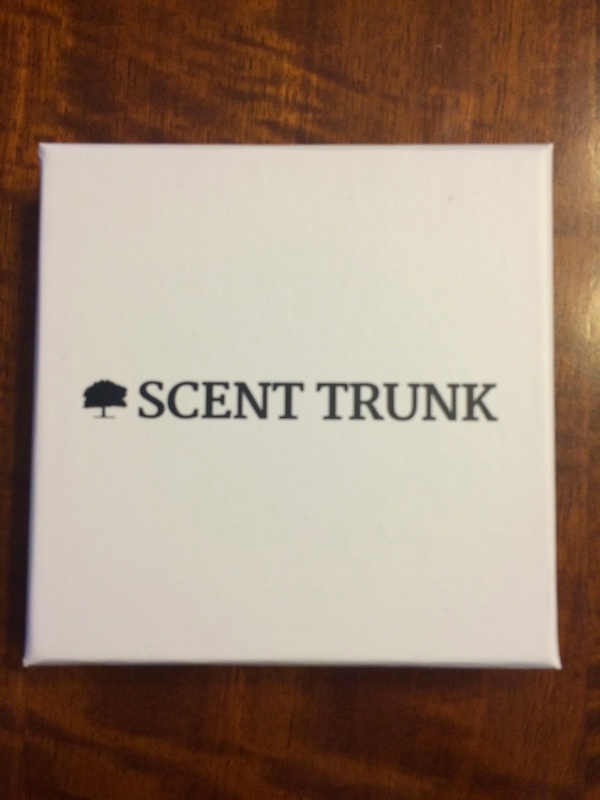 I'll be reviewing a new subscription box today called Scent Trunk. 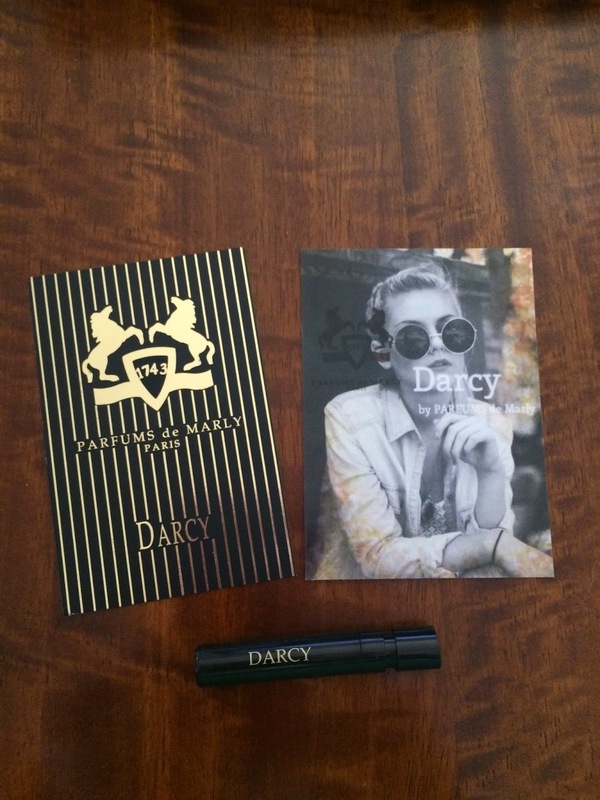 They are a subscription box that delivers three fragrance samples for $15 per month. Scent Trunk started out delivering men's fragrances, but will begin sending women's fragrances May 1st. As you know, fragrance reacts differently on everyone, so this is a great way to try a scent to see if it works for you. Then you can shop on their website to purchase the full size products if you'd like. 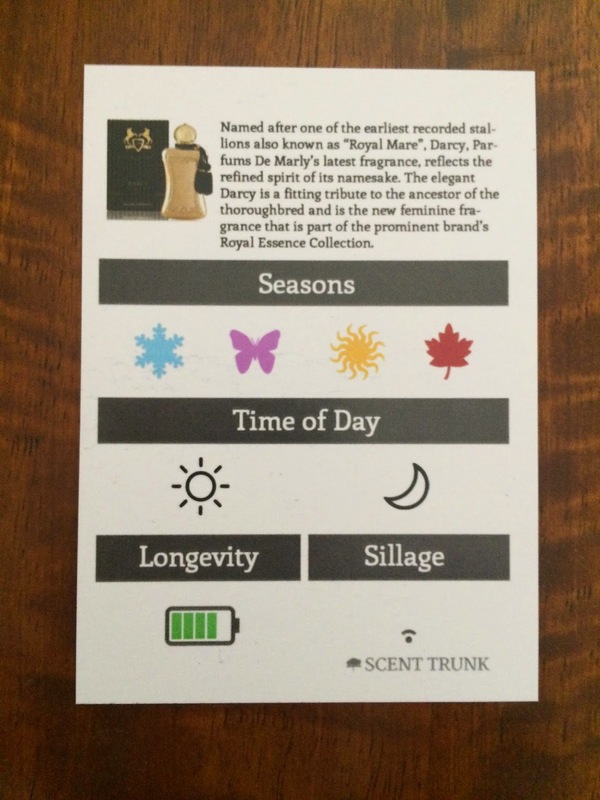 Scent Trunk also lets you sample fragrance that is not available in department stores. And they ship to US and Canada for free. When you sign up for a subscription, you fill out a fun survey, so they can learn about your likes and dislikes and what you may want from a fragrance. It has questions like "Where would you rather be right now?" and "Choose your personality type". It also asked how sensitive you are to fragrance, which I liked, because I hate strong scents. So, after taking the quiz I was very interested to see what they would choose for me. I have a difficult time finding fragrances I would wear every day, so I was happy to try this subscription. 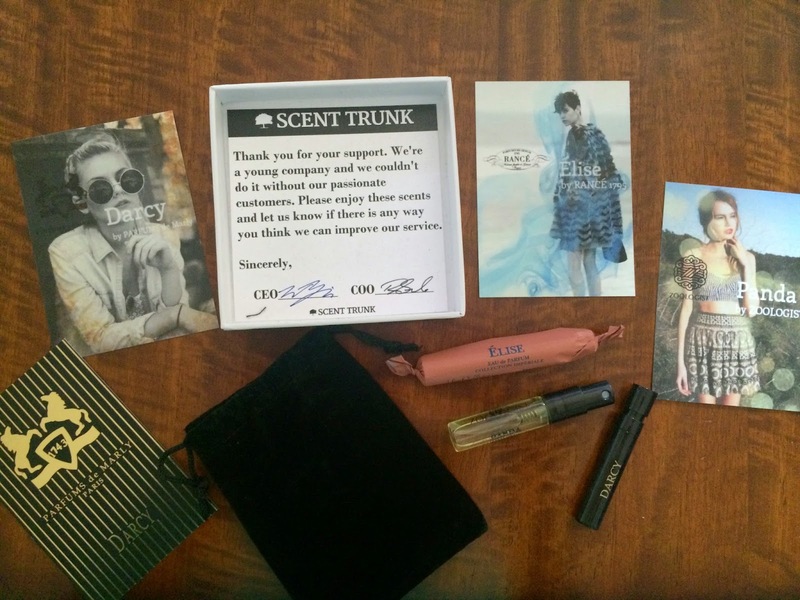 Scent Trunk was kind enough to send me a complimentary box, so I could tell you all about the women's subscription, before it launches May 1st. A small padded envelope arrived in the mail yesterday. I opened it up and there was a small box with the Scent Trunk logo. It was a nice presentation. When I opened the box, there was a black velvet bag and some cards explaining the fragrances. I'm happy they included cards to explain the fragrances! Here is everything included in the box. Ok, now onto the samples I received. The first one I tried was Darcy by Parfums de Marly. The information cards included are great. They give a description and say what seasons to wear the fragrance and the time of day, longevity, and sillage, which means the degree to which a fragrance lingers in the air when worn (I had to google that). This one was a bit too musky for my taste, but someone who likes a musk scent would love it. 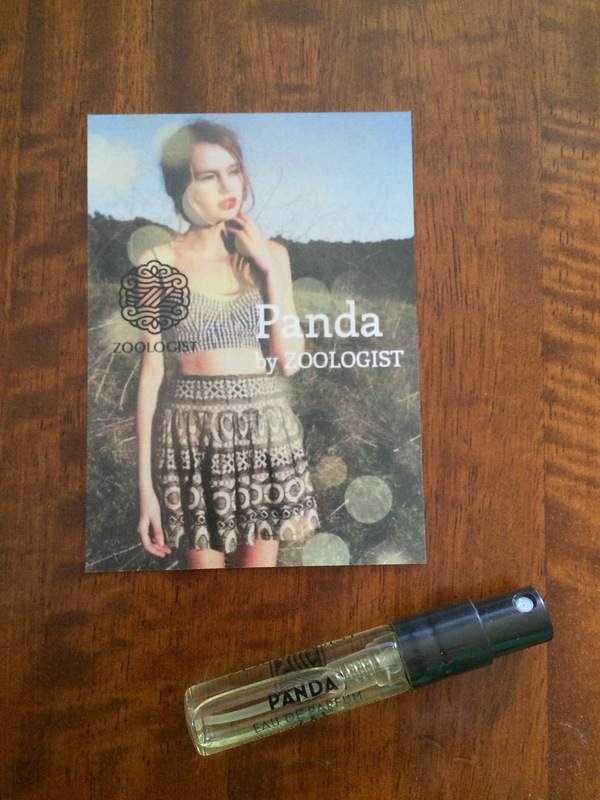 The next sample I received was Panda by Zoologist. This one had a very green and clean scent that reminded me of being outside in the grass on a spring day. I really liked it. This is a different fragrance, like nothing I've ever smelled before, which I prefer. It's unique and I could see myself wearing this one. 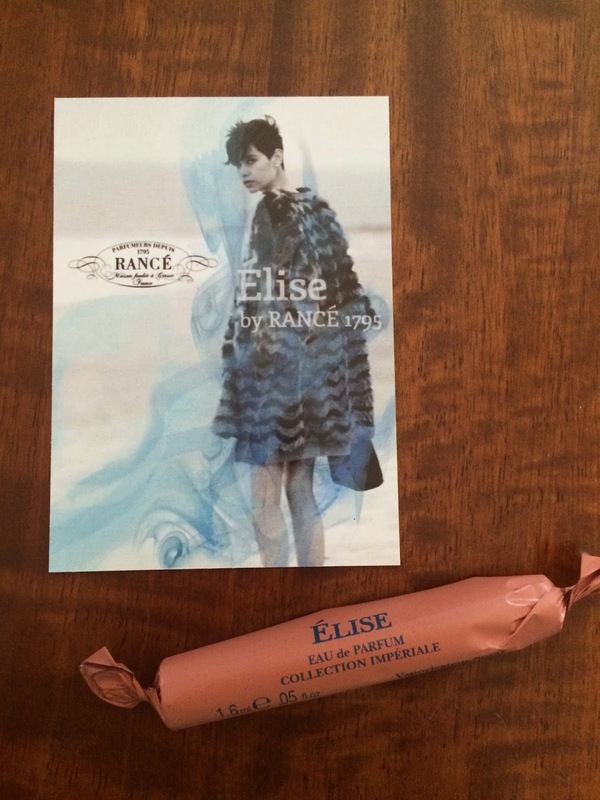 The final sample I received was Elise by Rance 1795. This was a nice floral scent that I liked also. It wasn't overpowering, which is great. I like subtle scents better. I could see myself wearing this scent with pretty dresses, because it was quite feminine and very nice. 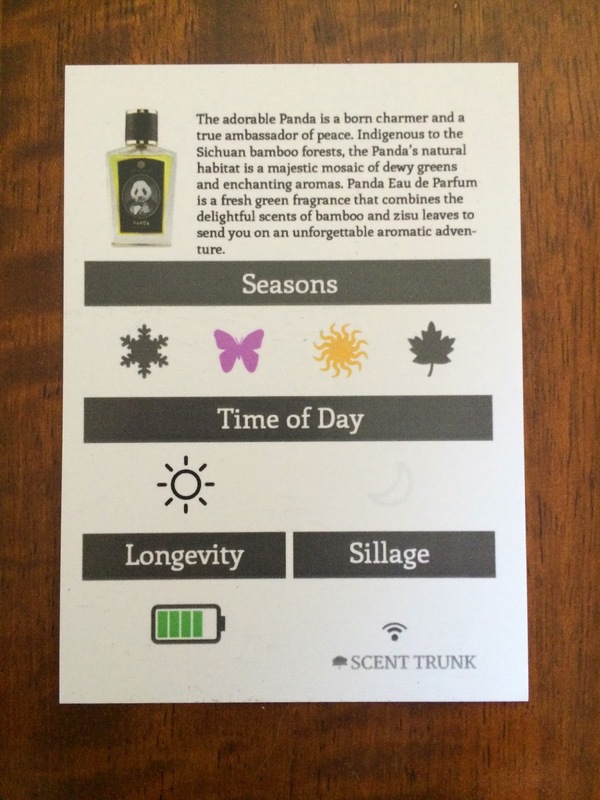 Scent Trunk was a fun subscription to try. I loved the survey and the samples chosen for me. I think this would make a great Mother's Day gift. It's always nice to find a unique scent that fits your personality perfectly. And since you can't buy these fragrances in every department store, you'll be one of a kind. If this sounds like something you'd like to try for yourself or buy as a gift, use the coupon code mothersday to save 25% off one box. This coupon code expires May 15th 2015. 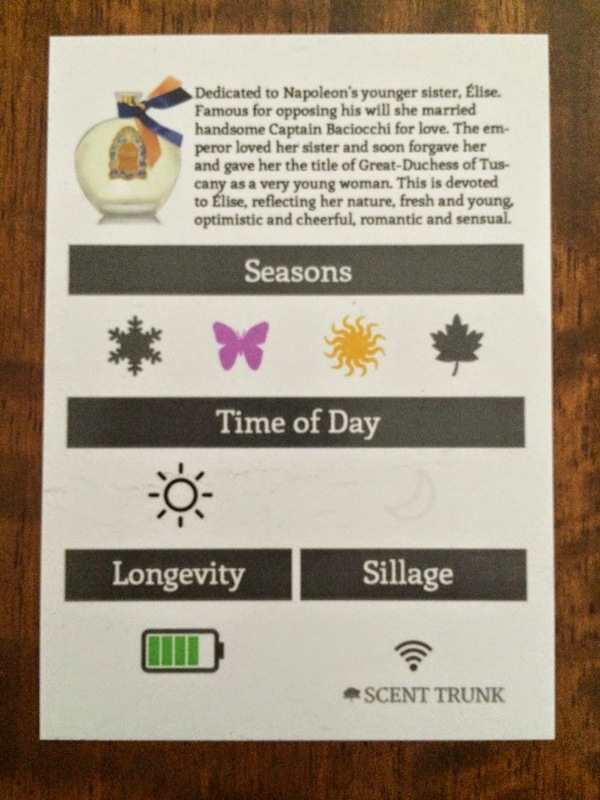 Check out this you tube video to find out more about Scent Trunk!